Since our last update, “Calling All Cars” when we suggested the technical set up for the market was good enough to invest some of your cash (1/3), we’ve seen more positive developments. But so far, the major market averages haven’t really gone anywhere. We’re still expecting higher prices from this level and here’s where you can find the relative strength leaders. The leadership that we’re seeing today really started back in February but has persisted now into April. That’s a good thing. We want to see new leadership stick and so far that’s happening. Sadly for many, the new leaders are not what you’ll find in the vast majority of investor portfolios, which continue to hold and hope with large multinational growth stocks. Here’s a short list of the new leadership across countries, sectors, styles and asset classes. These are all things that are outperforming the S&P 500 since the February lows. Virtually everything else is underperforming currently and thus does not qualify as a leader. Now some of these would probably be considered fear trades or runs toward safety as stocks are now moving 1-2% up and down based on the tweet du jour. Bonds and Utilities fall into this camp and we would continue to recommend avoiding these sectors and asset classes that depend on a falling interest rate environment. But the others look pretty good and we’re focusing on these to add back some net exposure. In the last week, we have followed our Net Exposure guide, which has moved from a -8 to a -2 (last week) and is now flipping positive with a buy signal from the High Yield market. Subsequently, cash in our tactical equity models has moved from nearly 40% to around 20% depending on the strategy. Commodities and hard asset investments that stand to benefit from continued global economic growth as well as the inevitable rebuilding of America’s “nostalgic” infrastructure, are especially interesting to us now. “The state of Mississippi’s bridges are in such bad shape that the governor has ordered at least 102 closed this week.” WSJ, April 12th, 2018. What other reasons do we have to like commodities and hard asset stocks? Well first, they are just about the only place to find real value in the financial markets. We’re finding stocks that have single digit P/Es , high free cash flow and improving return on equity numbers. Second, the business cycle says that commodities and hard assets should be next to run higher as stocks carve out a long term peak (maybe this summer?) and bonds continue to fall. 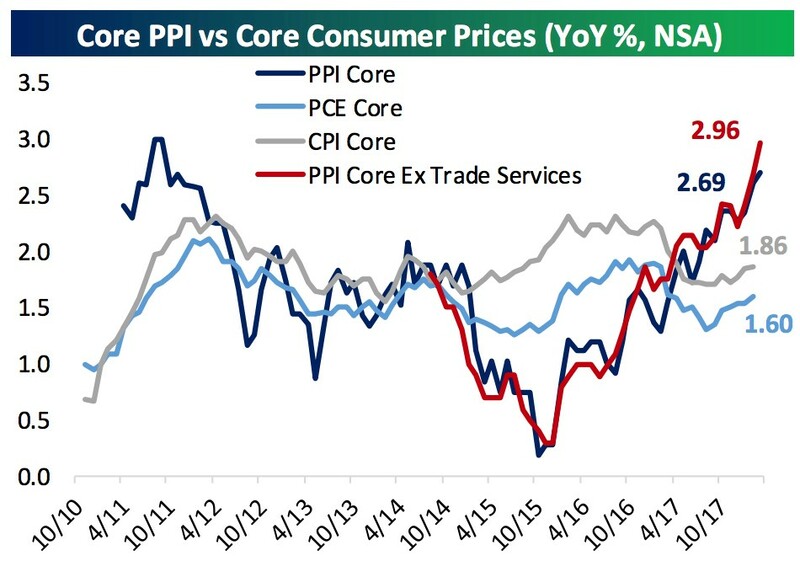 Finally, PPI (Producer Price Index) and CPI (Consumer Price Index) reports this week confounded the forecasters and showed inflation is now kicking up significantly. It’s not hard to see in this chart from Bespoke. Just wait until the tariff wars kick in. Protectionism is INFLATIONARY – write that down and expect it. Personal Opinion side note – Trump is full of hot air on practically all things, except trade. He’s not bluffing. This is not some tactic in the “Art of the Deal”. And now he has fired his advisors who questioned his choices, replacing them with yes men (Kudlow and Co.). We’re going to have a trade war and it will be Trump’s legacy. Actually, it’s already happening. Mega cap domestic companies that rely on importing cheap goods as well as select exporters are going to suffer. No wonder we’re seeing strength in domestic small caps that source and sell everything right here in the US of A. So we like commodities and hard asset investments. We have also found this level to be a reasonable place to buy some of our existing positions for a lot of new money that has arrived at our door in the last several months. What a perfect segue. I want to tell you a client story with a lesson for all to consider. I have omitted names to protect privacy but this happened last week. A long time client had some significant money outside of our management with another advisor. She called us to discuss bringing everything over to All Season Financial. In that conversation, we asked why. “Why are you wanting to bring your outside assets to All Season Financial?”, we asked. Simplify and Consolidate – There is a real benefit to having all investments in one place. Everyone can see everything, measure success and returns, make sure every investment serves a unique purpose in the whole portfolio and create cost efficiencies with higher assets under management in term of fees and expenses. Pleased with All Season’s performance in all markets. We never hit home runs but we are consistent about our returns in all market conditions. Our clients understand that consistency and timely capital preservation is likely to become more important now than in years past. See the whole picture – This sort of gets back to the benefit of consolidation but in this example, our client wanted us to manage and calculate the required minimum distributions on all of her IRAs and handle monthly cash flow needs rather than having to work out the math herself across different custodians and advisors. “They would charge huge commissions to sell my stocks” – It’s sort of mind boggling to me that various brokerage firms and most banks still charge high commissions for stock trades. Fidelity charges $4.95 to buy or sell up to 10,000 shares of anything. In this case, our client had a bunch of stocks held away from us and wanted to bring them over in kind so we could gradually sell them at Fidelity without the huge commissions. Makes sense! IRAs held inside an Annuity – This one makes me crazy and I see it all the time. Our client had a substantial IRA that was invested in an annuity. IRAs are already tax deferred and thus they do not need the tax deferral offered by the annuity insurance contract. The only reason you would ever see this situation is because the broker wanted to earn a commission on the sale of the insurance contract. Shameful but very standard in our industry. This type of practice is the very reason why the brokerage world is lobbying hard to avoid execution of the new Fiduciary Rules. We welcome them as we’ve been uncompromising fiduciaries (not product salesman) for our clients since inception in the 90’s. If you ever have a question about whether your broker/Advisor is a Fiduciary (acting in your best interest), ask them to show you in writing all sources of revenue to them associated with your accounts. You might not like what you see. Hopefully, you see the lessons in this commentary. There are a lot of sharks in our business that are not sitting on the same side of the table as their clients. They are sales people, product pushers and commission grabbers to put it bluntly. Today, you really have to ask because everyone says they are your “advisor”. But follow the money and you’ll find another truth.